Have you been dreaming of creating beautiful DIY wedding invitations but feel overwhelmed by the prospect of designing and assembling the perfect card? e.m. papers makes it easy and economical to create your own wedding and/or rehearsal dinner invitations at home using their “printables.” Printables are DIY cards that you can download and print on your home computer. e.m. papers offers sophisticated styles that you print onto heavy cardstock or custom stationary paper (this can be purchased at your local craft store). Check out a few of my favorites below. 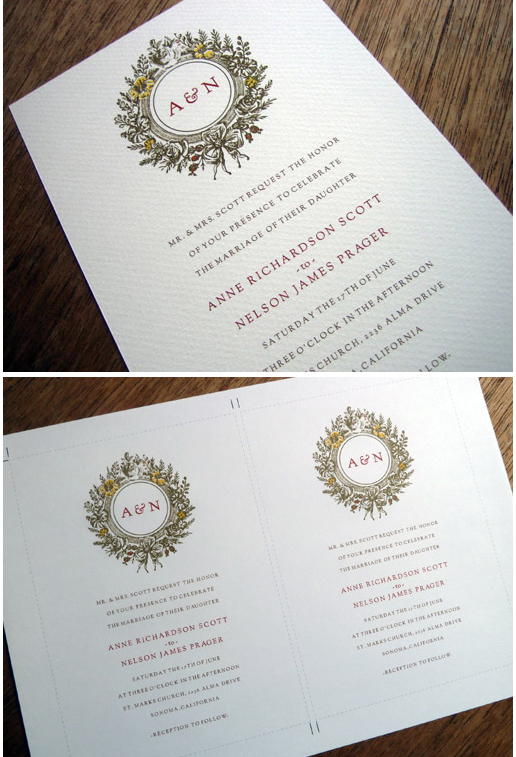 The traditional Monogram (above) invitation has classic appeal. The rich golds and browns would be lovely printed on cream cardstock and perfect for an autumn wedding. The 5×7 flat invitations print two per page. 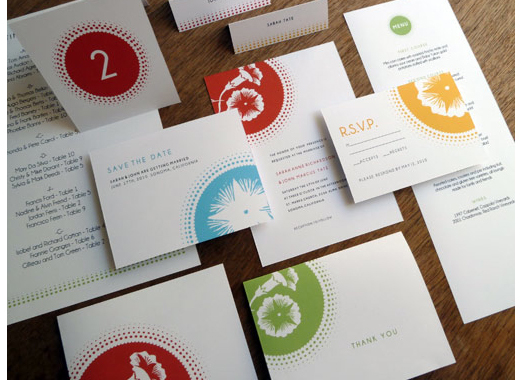 Bold and colorful, whimsical florals decorate the Morning Glory (above) wedding invitation. Order this design individually or order as a set ($65). Set includes invitation, save-the-date, response card, wedding program, menu card, place cards, table numbers, seating list and fold over thank you notes. Here’s a deal that seems too good to be true…but it is! 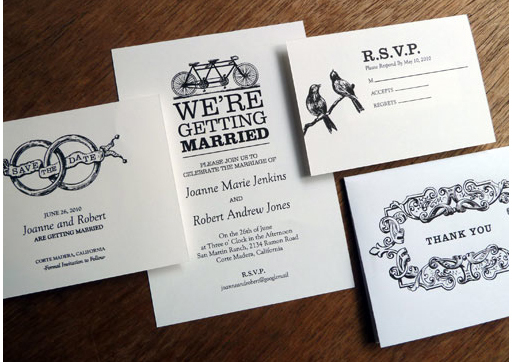 e.m. papers is currently offering a free vintage, black and white printable wedding invitation and correspondence set. The simple yet elegant Bike design would be charming for a day or evening affair. What a deal! Each invitation and set comes with a template and text which you simply overwrite with your personal information. Also included is a detailed how to guide which provides clear step by step instructions for creating each item in the set. DIY made easy – how sweet!